I have an undeniable passion for Scotland fueled by a number of things, including the Scottish blood running deep within my veins, as well as my love of anything Outlander (books and TV series.) 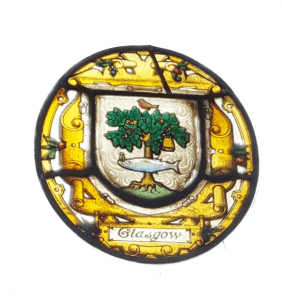 So when I stepped into the hotel lobby of the Caledonian – I felt I’d arrived at a place I knew was going to be hard to leave, two days later. 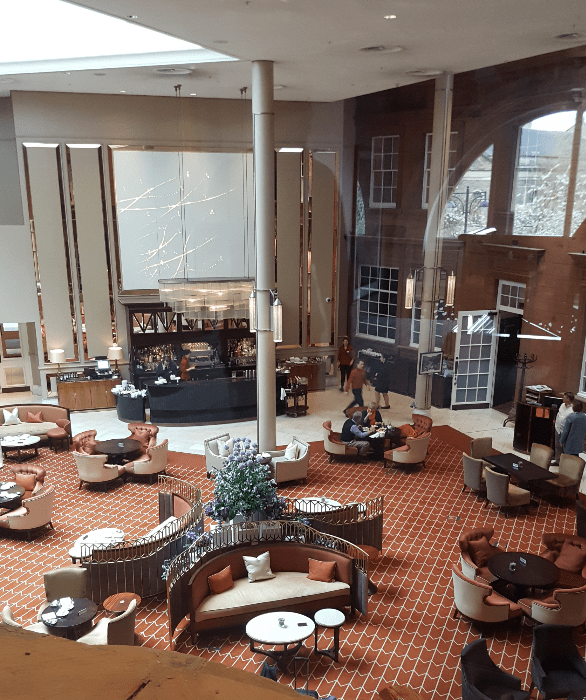 Walking through the hotel’s impressive grand arches, left no doubt of the hotel’s historical significance in Edinburgh. 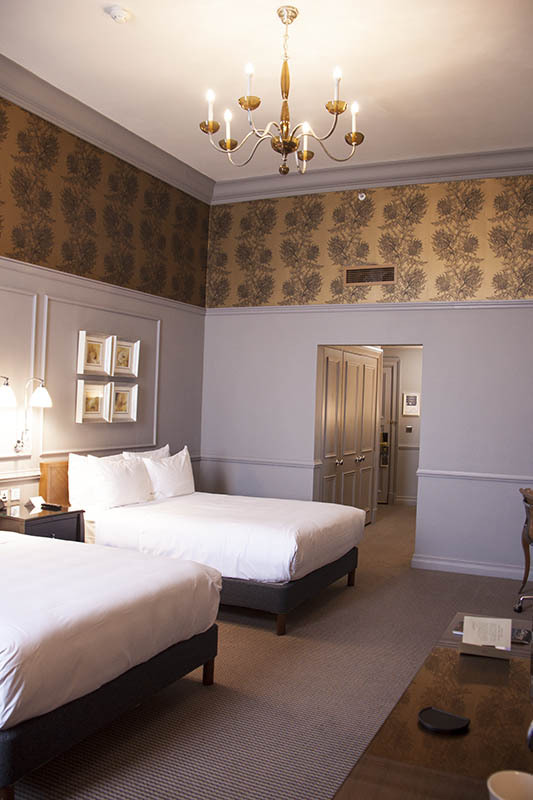 First impressions from the lobby was a mix of subtle grandeur and classic style. 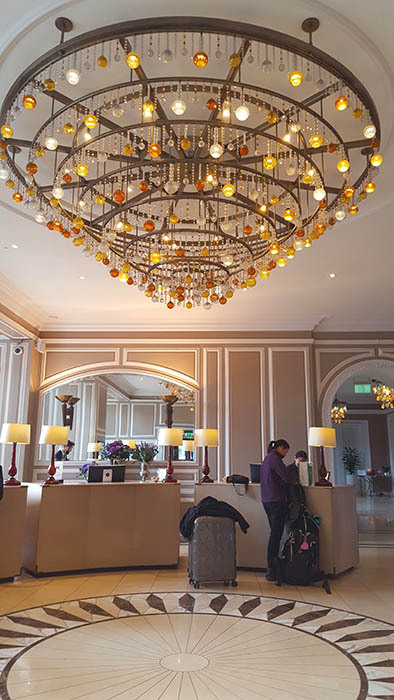 The tartan trousered doorman – a nice touch to remind guests what country we were in – but there was something else about the greeting received as my friend and I checked in. 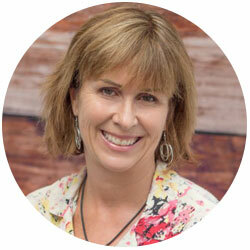 It was welcoming, yes, warm – most definitely – but it also felt genuine. Being escorted to our room by our check-in person was another special gesture and an indication of things to come over the next 48 hours in this grand old hotel. 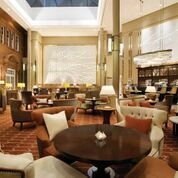 The Waldorf Astoria Caledonia in the heart of Edinburgh City is a luxury hotel with more than a passing nod to the history of a bygone era. 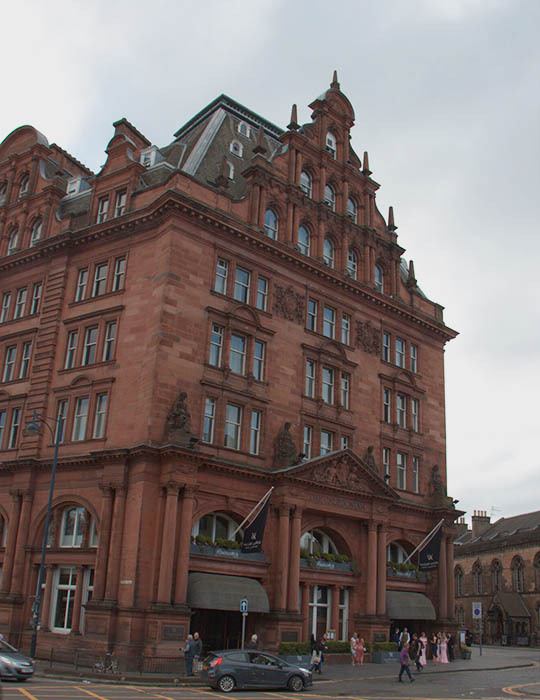 Constructed between 1899 and 1903, originally the site was a British railway hotel, called the Caledonian. Passengers accessed the station below through a set of grand arches, which have been maintained to form the current impressive hotel entrance. The station closed in 1965 and was demolished five years later, leaving room for the hotel, to expand. 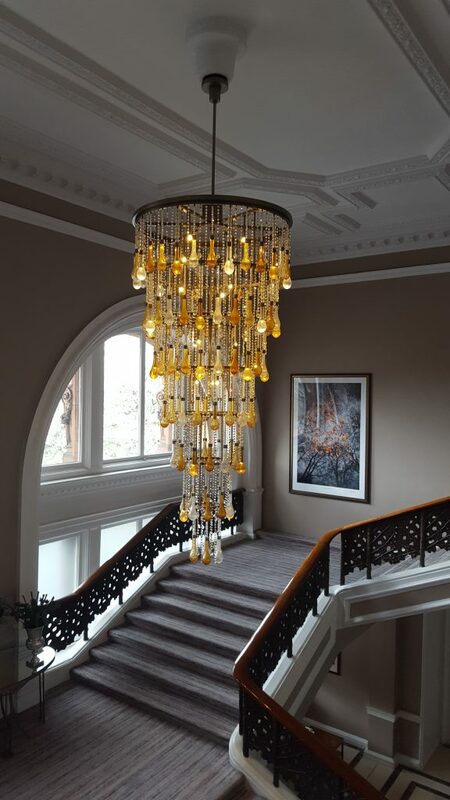 The Hilton Hotel chain purchased the site in 2000 and eleven years later, injected a wee 24 million pounds in a refurbishment project transforming the hotel to its present luxe status. The redesign of Peacock Alley into a casual lounge is cleverly designed to maintain the look of a station concourse and ticket office – with much less noise and hurry. The high walls create an open space which is covered by a beautiful glass atrium roof, creating a relaxing, light and airy lounge area with bar, chairs, and sofas casually arranged to encourage sitting and quiet conversation. No more hurrying to platforms to catch the last train. 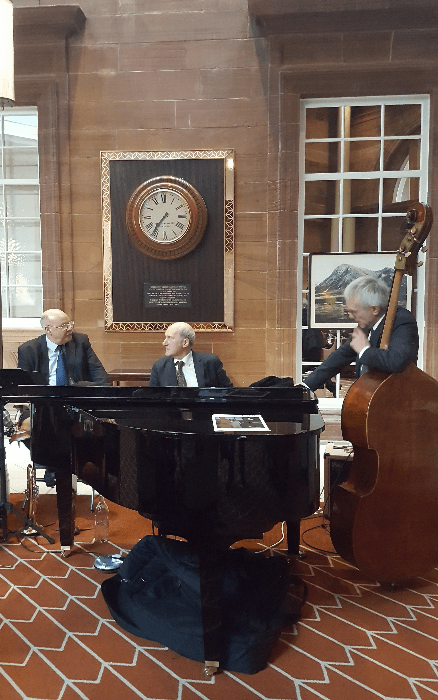 On Saturday evening (my first night) a few musicians gather around a grand piano, happily playing any special requests. 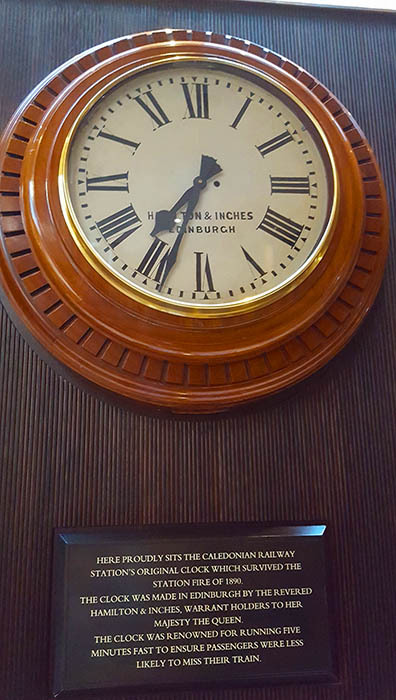 The original Caledonian Railway clock station clock, which survived a station fire in 1890, sits prominently on the wall behind them. I’m informed by one of the musicians the clock still runs five minutes fast, a legacy carried on from the when it was the platform timekeeper. Another reminder of the clever use of historical pieces throughout the hotel. The hotel currently has 241 rooms over five floors (although there are actually six floors if you count the Mezzanine level.) We stayed in a double double room, with tall velvet drapes to block out the long days of sunshine we were lucky enough to experience on both days in Edinburgh. This was the kind of room you wouldn’t wish to leave and my travel buddy, who’d succumbed to some drastic respiratory bug during our tour of Isle of Skye did just that – stayed put and rested for two days in very comfortable surroundings. 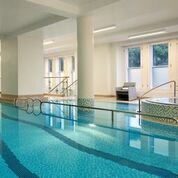 The hotel’s modern leisure club fitness centre, spa and wellness centre with a 10-metre lap pool is the perfect place to escape and ease tired muscles after wandering Edinburgh’s cobblestoned streets. Alternatively, the relaxation room offers beauty and skin care treatments in the luxurious Guerlain spa. 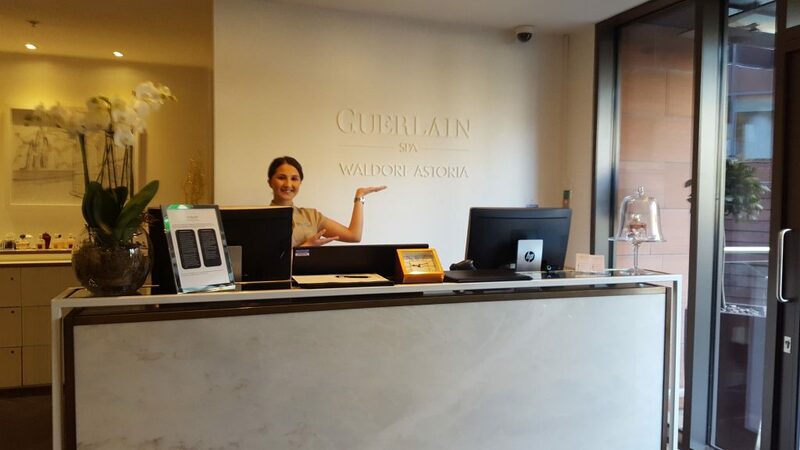 The hotel proudly boasts they’re the one and only spa in the United Kingdom using Guerlain. 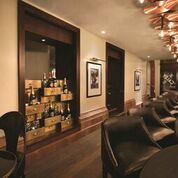 In the shadow of the iconic Edinburgh Castle, this hotel is close to the sightseeing attractions and the shops. The Edinburgh International Airport is an easy 20 minutes taxi ride or it is possible to take the airport tram 2 minutes from the Hotel Door. Edinburgh’s main train station – Waverley on Princes Street – is a 5-minute stroll from the Hotel, should you need to transit to Glasgow or another of Scotland’s grand locations. Only a few minutes walk through the picturesque Princes Garden, brings you to the heart of the action – Edinburgh’s Royal Mile. Catch bus no. 22 at the bus stop at the corner of the hotel to the Ocean Terminal area, where its possible to tour the de-commissioned Royal ship the Britannia. This is an enlightening insight into how the Royal Family entertained and relaxed on the well-known vessel. The stunning St John’s Cathedral is literally across the road from the Hotel’s main entrance – should you be staying on a Sunday, consider attending a church service in one of Edinburgh’s stunning chapels. I did read somewhere, if you’re in the Caley Bar and order a bottle of champagne, the top may be lobbed off by a saber-wielding specialist. If this luxury hotel, superb amenities and its well-trained staff are not enough, a saber-wielding specialist definitely provides a reason to return! Can you tell, I’m already wishing to re-visit my beloved Scotland?! The imposing hotel with its distinctive tall green spire is easy to locate in any part of Edinburgh city.